you’re only five and a little bit over! Happy leap day to everyone. And in a particular happy birthday to those who share Frederic's natal day and are thus, today, precisely 1/4 of the age that they actually are. His stars on the wall. He must dwell quietly. As shapes, though they portend us, are. ...which are my favorites, I think. But I decided what the heck, and am posting the whole poem. Enjoy. • Marc Singer's book on Grant Morrison has been published. 'Nuff said. • L'affaire Magneto: What if Herge had Created the X-Men? • Does the Bible call homosexuality an "abomination"? During the late 1800s there was considerable debate about how “religion” should be rendered in Japanese... It seemed that “religion” could be a type of education, something fundamentally un-teachable, a set of practices, a description of foreign customs, a subtype of Shinto, a near synonym for Christianity, a basic human ethical impulse, or a form of politics (among other possibilities). • Via the above, another interesting (critical) review of the same. • Andrew Rilstone has self-published some of his earlier Tolkien writings, under the title Do Balrogs Have Wings? and Other Pressing Questions (and Other Pressing Questions). 'Nuff said. • ...Except maybe not, so for those poor benighted souls who have yet to encounter Rilstone's Tolkien writings, here, via web archive, is the title piece to the above-collections, presenting the definitive answer to that question, at least. • More recent Rilstonish Tolkien goodness: on the Silmarillion. • Sixteen-year-old high school student writes (in 1963) to a series of well-known novelists, including Jack Kerouac, Ayn Rand, Ralph Ellison, Ray Bradbury, John Updike, Saul Bellow and Norman Mailer asking them questions about symbols in their work. Answers presented as given. • John Clute on Margaret Atwood on SF. • This interesting review of Stephen King's latest novel makes me want to read it. • Woody Guthrie's story of the one-eyed banker. • Man stopped by the police for "babysitting while white"... again. • "After ‘The Wire’ ended, actress Sonja Sohn couldn’t leave Baltimore’s troubled streets behind"
* Shakespeare always was ahead of his time. So Mormon baptism for the dead is back in the news. After repeatedly promising not to posthumously baptize Holocaust victims, the Mormons have -- once again! -- been caught violating that promise. Elie Wiesel has publicly called on Bishop Mitt Romney asking him, in his capacity as a person running for President who happens to be Mormon, to do something. * In short, once again People Are Upset. Now, I grant you that, having promised to stop, the Church of Jesus Christ of Latter-Day Saints ought to carry out their promise, simply because, all things being equal, everyone ought to fulfill their promises, and there seems to be no reason that this one has been nullified. But having said that, the entire issue raises, for me, another question: which is why the members of my tribe cared enough to extract the promise in the first place. Why do Jews -- or anyone who is not a Mormon -- care about the Mormon's baptism of the dead? I get that they do. I get that I may be the only Jew on God's footstool who thinks that it doesn't matter. But really, I not only don't think it matters, I don't understand why anyone else does think it matters. There are two basic possibilities. Either Mormon cosmology is basically right**, or it's not. If Mormonism is wrong -- and really from this point of view it doesn't matter if the truth is the cosmos as described by the Jews, the Catholics, the Baptists, the Muslims, the Humanists, the Pastafarians or what have you -- then the so-called "Baptism of the Dead" does literally nothing. It is about as efficacious as children playing make-believe. At worst it does some spiritual damage to the living persons engaged in the practice; it certainly has no effect on the dead. Getting upset about the Mormons' actions is like getting upset when children at play say something like "everyone here is a cow". If, on the other hand, Mormonism is right -- as far-fetched as that seems -- then of course the "baptism of the dead" is efficacious, and actually is doing the deceased a favor. So we should be glad they did it. Either it's meaningless and stupid, or it's the right thing to do. Either way, how can anyone object? I've heard only a few objections that aren't entirely answered by the above argument. But none of them strike me as particularly convincing either. One objection is that Mormons can then claim that the dead -- from Shakespeare to Hitler to Barack Obama's Mother -- are Mormons. And the answer is: yes, of course they can. They can also claim that Native Americans are descended from Israelites, that there were horses and wheels in pre-Columbian America, that God lives out on a planet called Kolob, that God just happened to change his mind about the essential racism of his previous doctrines in 1978 and that the social embarrassment of the doctrine in the post-Civil Rights age for the leaders getting the "revelation" had nothing to do with it. And so forth. They can claim anything they like -- and they claim a lot. So what? It doesn't make it true. And the answer to this is, well, it's conceivable --- if the future historians involved are very, very sloppy and very, very ignorant about the context and very, very stupid. It's not like the doctrine of the baptism of the dead is secret; anyone researching the life of Shakespeare or Obama's mother who concluded that they were really Mormon because they appeared on the Mormon rolls would be, basically, unqualified to research anything at all. But yes, it may happen. But then, maybe people in the future will decide all sorts of stupid things. The slight chance that stupid people years from now might misunderstand present-day actions seems like a really poor reason for not doing them. The final objection -- and, I suppose, the nub of the matter -- is that it's disrespectful. This, of course, is true. It is disrespectful. It embodies the fact that Mormons think (as do the adherents of most faiths) that all the rest of us are fundamentally wrong, and that, worse, we're in some sense damned*** for being wrong. It implies that, say, Jews who lived their whole life as Jews and who were systematically murdered for being Jews were, in fact, off-base and would, in the afterlife, ditch their faith for an American religion they'd probably never heard of in this world. Sure, I personally find these doctrines abhorrent. But you know what? Those who hold them won't care about what I think about their beliefs any more than I care what they think about mine. To the extent that anything's disrespectful, it's not the posthumous baptism, which is a mere instantiation of a larger phenomenon, it's that Mormon doctrine is disrespectful. And not just Mormon doctrine: any non-universalist religious belief that requires adherence for salvation is basically disrespectful of the entire rest of humanity. And sure, we might well argue against them on that basis -- although personally I think the fact that there's no actual evidence supporting them is ultimately more to the point. (But then, that's me: I'm concerned with evidence and argument and logic. Others go by their guts, or the burning in their bosoms, or what have you.) But objecting to what they think they're doing on the basis of those beliefs seems to me just silly. I get, on some level, how this might seem like defiling the graves of the dead. But it's really more like setting up a stone somewhere far from where the dead in question ever were in their lives, calling it (without any basis) their grave, and defiling that.§ Yes, sure, a sign of disrespect. But it's really just a sign of an ongoing disrespect, one that is fundamental to their beliefs, rather than having anything specifically to do with the symbolic action... that we have to go out of our way to find out about if we want to be offended by it. Roll your eyes at it? Sure. Think less of them for doing it? Ok. But make a big stink about it? Why? In fact, if you think about it, the gravestone analogy above is precisely accurate. The Mormons aren't, after all, baptizing the dead (they're not, say, disinterring the bones and sprinkling water on them); they're baptizing young Mormon teenagers and saying that they're baptizing the dead. It's only true if they're right (in which case they're right.) From a non-Mormon point of view, they aren't baptizing the dead; they just think they are. The point is, a non-Mormon should no more believe that the Mormon baptism of the dead does anything (save please those among the living involved in it) than I believe that my son's frequent announcement that he and I are both Buzz Lightyear does anything. Personally I think that they're pretty equivalent -- save that my son, of course, is three years old, and therefore the fact that he speaks like a child, thinks like a child and understands like a child is perfectly appropriate. The sole remaining argument is that, having promised to stop, it is disrespectful to continue. And here, I must admit, I think the opponents of the baptism of the dead have a good case. It's an oddly self-supporting one -- fulfill the promise, which there was no particular reason to ask for or to make in the first place, because not to would be disrespectful. But I suppose one could say that that ship has sailed. But it might help my landsmen to keep things in better perspective to remember that the underlying issue is a children's game that adults like to play, and that it means about as much (unless they're right, in which case it means everything, but it's good they're doing it.) And breaking a promise to stop doing something which is itself meaningless is, as disrespect goes, pretty small bones. To object to the Mormon baptism of the dead is ultimately to subscribe to a small slice of Mormon doctrine, namely, that part that says the baptism of the dead actually has some effect (if only to offer souls in the afterlife an option). Those of us who are not Mormons should be able to recognize that this Mormon belief like all the others is simply false: that the baptism of the dead does nothing. Who cares what games others play? All Dead Mormons Are Now Gay! Incidentally, in addition to some substantial comments below this post (if you've read this far, check them out too), the above-linked post has some discussion of this issue (with reference to this post) in its comments too -- click through if you're interested. And thanks to Holly for linking! Update 2: Via comments to that same post, Stephen Colbert posthumously converts all dead Mormons to Judaism. Update 3: In a Slate roundtable, some of the Slate writers (including fellow Jews!) reach parallel conclusions to the ones I argue for in this post§§§. So I guess it's not just me, although I still think we're in the minority. Update 4: And the "who cares?" brigade gains yet another member. In contrast, here's another in the "it's disrespectful" camp. (Both via Sullivan). * Even if you agree with Wiesel on the basic issue, you could make a pretty solid argument that asking someone who is prominent in a non-religious capacity to intervene in a religious matter he had nothing to do with just because it happens to be his religious group is fairly offensive in its own right. Asking the church is one thing; asking the person who happens to be running for president is another. ** Something I think is far more disprovable than most religious claims, since Mormon doctrine is less shielded from empirical and logical investigation than that of most other religions. But that's another story. *** Although my vague sense of the matter is that the Mormon hell is a breeze compared to that of, say, the Baptists and the Muslims. **** Actually, you could argue that the baptism of the dead is a lot more respectful than that of standard religious groups. The standard (non-universalist) line is that if you didn't happen to pick the right religion in this life, you're screwed: if you got the "Jesus or Mohammed?" question wrong, then, whoops!, a lifetime of torture for you. The Mormons at least think that, having screwed up in this life, you get a second shot. Which, after all, is more disrespectful: to think that every Jew who died in the Holocaust is burning in hell, or that only those who did not accept a posthumous baptism are? I'm very sorry, baby, doesn't look like me at all. §§ Once I'm dead, you can get your revenge by baptizing me by proxy. Which (I feel confident) won't do anything. But which you can do, feeling the satisfaction in the belief that you are showing me up and doing me a favor at the same time -- a rare combination of (self-congratulatory) self-styled beneficence and condescension. It's fine. Because I won't mind. Because we're talking about after I'm dead -- and the mind dies with the body. §§§ I'd like to say they "echo" my points here, but the truth be told I think that the chances that any of them saw this post are nil. Sadly. But at least it's clear I wasn't echoing them, since I posted mine ten days before they did. One of the intriguing things about Leonard Cohen, at least to me, is that he was a published poet and novelist before he became a singer (his music being, of course, what he is now best known for). The following poem, "The Gift" was from his second book of poems, The Spice Box of Earth (1961); it was reprinted in his 1993 collection Stranger Music: Selected Poems and Songs. It's something in between, I guess. The other one, the one called Borges, is the one things happen to. I walk through the streets of Buenos Aires and stop for a moment, perhaps mechanically now, to look at the arch of an entrance hall and the grillwork on the gate. I know of Borges from the mail and see his name on a list of professors or in a biographical dictionary. I like hourglasses, maps, eighteenth-century typography, the taste of coffee and the prose of Stevenson; he shares these preferences, but in a vain way that turns them into the attributes of an actor. It would be an exaggeration to say that ours is a hostile relationship; I live, let myself go on living, so that Borges may contrive his literature, and this literature justifies me. It is no effort for me to confess that he has achieved some valid pages, but those pages cannot save me, perhaps because what is good belongs to no one, not even to him, but rather to the language and to tradition. Besides, I am destined to perish, definitively, and only some instant of myself can survive in him. Little by little, I am giving over everything to him, though I am quite aware of his perverse custom of falsifying and magnifying things. Spinoza knew that all things long to persist in their being; the stone eternally wants to be a stone and the tiger a tiger. I shall remain in Borges, not in myself (if it is true that I am someone), but I recognize myself less in his books than in many others or in the laborious strumming of a guitar. Years ago I tried to free myself from him and went from the mythologies of the suburbs to the games with time and infinity, but those games belong to Borges now and I shall have to imagine other things. Thus my life is a flight and I lose everything and everything belongs to oblivion, or to him. -- Leonard Cohen, "Going Home"
Leonard Cohen's new album, Old Ideas -- of which "Going Home" is the first song -- is absolutely fabulous, by the way. As of this writing the entire thing is still available for streaming at the link. Give it a listen. In addition to his characteristically fabulous lyrics and music, you also get to hear his voice continues its extraordinary plunge towards auditory absolute zero, a musical zero degrees Kelvin, the lowest possible tone in the universe. As for "Borges and I", in trying to find a copy of the text to put here, I came across this interesting critique of Andrew Hurley's translation by Antonios Sarhanis. * Sarhanis's own translation is here, along with the original Spanish. The version I linked to (chosen more out of familiarity than out of considered preference, I must admit), plus the original Spanish and two others (but neither the Hurley nor the Sarhanis) is from this page here. * Via Sarhanis, this blog post sets out some of the background about the existence of Hurley's translations -- claims that were certainly new to me. More here. Sarhanis, meanwhile, has translated a number of other Borges stories too. I don’t want money. What I want is for this not to happen. A kinda-obvious thought occurs: the actual Watchmen sequel? The last 25 years of superhero comics. The pedant in me wants to point out that the last 25 years are by definition not a sequel to Watchmen, but what they most definitely are, at least on some level, is a response to Watchmen; the artistic ground has been well and truly covered, making any retreading of Watchmen’s ground almost certainly redundant except as an exercise in getting dollars ‘n’ press. As for comparing Moore's use of James Bond or Voldemoort or Dorothy Gale or even The Peacemaker with the More Watchmen effort, that just seems so clearly to me not the same thing by a thousand degrees I can only look on at anyone making that argument with bafflement. I don't even know how to articulate a counter-argument. From my perspective, it's not saying "the sky isn't blue; it's green" it's saying "the sky isn't blue; it's refrigerator." What Moore is doing is taking a whole bunch of things from all sorts of different works and repurposing them into something else. He’s not trading off their value as intellectual properties (how many comics fans were clamouring for the further adventures of Alan Quartermain?) but making a commentary on the original works, while creating something new. The tension inherent in this whole project is that, in order to make an argument for the legitimacy of Before Watchmen, DC have to argue that Watchmen is in this respect basically like other superhero comics, so that sequels should be judged by the same standards that apply to, say, a revival of X-O Manowar or Cloak & Dagger. But Watchmen‘s reputation rests on precisely the opposite belief – that the book is exceptional and unique and even important, and most certainly not like other superhero comics. And that reputation is the whole reason why we’re meant to care about Before Watchmen in the first place. I'm also not certain how you can see this as anything but a step away from the wider cultural message of Watchmen back in the 1980s: that authors matter, that original work can be rewarded on the same level as reworking someone else's ideas, that comics have literary and culture value for their ideas and expressive force above and beyond their value as entertainment product. I might call DC foolish if they were touting these sequel books as a match for Watchmen's artistic achievement, but that this idea isn't even on the table may be scarier. This is a toy line. This is a happy meal. This is "based on." This is product. Everybody knows — everybody knows — that this NuWatchmen thing is pretty much what I called it above, i.e. cynical and exploitative…that’s not a secret. My God, it so ISN’T…! And yet you will try to snow me about it. 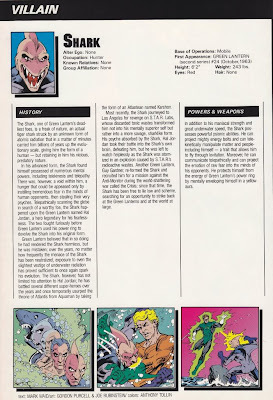 I've enjoyed pieces of work from all of the writers who are contributing to this supremely ill-considered endeavor, but I wouldn't consider any of them to be anywhere near Alan Moore's league. To be fair, the only name writers in the American comic book industry[**] that i can imagine following Moore would be Grant Morrison and Neil Gaiman... Of those chosen, Azzarello is the only one who seems to have enough quality output under his belt to even dare comparison to Moore, but in both critical esteem and sales popularity, he seems Lilliputian in comparison. Cooke has likewise written a few very solid genre works before, but nothing that's dazzled in the way Moore's Watchmen's writing does, or even in the way Moore's lesser works do. A sequel, a prequel or even a suite of character-specific one-shots is one thing. But DC is publishing seven prequels, and each of them is an entire miniseries of its own, running between four and six issues. At this point, the Watchmen prequel event involves 34 individually sold comic books, and there's a promise of at least one more book to come.... This isn't Frank Miller following Dark Knight Returns with Dark Knight Strikes Again, this is 11 of Miller's less-popular, less-successful peers doing 35 sequels to DKR. Let’s not kid ourselves here, let’s just look at some numbers. The bestselling individual comic of the last ten years, by miles, is the Obama inauguration issue of Spider-Man, which sold about half a million copies in early 2009. The same year as that, twice as many copies of Watchmen were sold. It had a cover price five times higher. So don’t anyone delude themselves that this is DC taking moribund smelly clapped out old Watchmen and pouring in energy and lifeforce, hoping a bit of magic will rub off. It’s exactly the opposite. Inevitably, once the precedent has been set, now that ‘difficult’ commercial decision has been made, there will be a Watchmen III, and a Watchmen IV. Every few years, from now on, enough material to collect into a new Watchmen book will come out. And DC will be working down their list of creators, and in a few years they’ll be assigning people who managed to boost sales of Hawkman by 15% the previous year. If DC will go ahead with more Watchmen, of all things, and, more importantly, if it succeeds... does that mean we'll see a Gaiman-free Sandman relaunch of some sort next?... we're getting "Before Watchmen" anyway. As depressing as that is, here's a more depressing thought: What comes after "Before Watchmen"...? I’m going to try to explain this purely in bean counting terms. Think about Watchmen as units shifted, think of it solely as product....The unique selling point of Watchmen is that it’s one of the very few comics where you can hand it to someone and say ‘this is it’. You don’t need to collect, you don’t need to worry about what order to read things. You don’t need a Powerpoint presentation from a guy in a comic shop explaining how you also need to buy Thor Annual 5 and don’t forget they renumbered around issue 600 and don’t forget the miniseries that ran alongside the main one. One volume.... Watchmen 2 won’t ‘weaken’ the original Watchmen artistically. It does, though, chop away perhaps its main marketing advantage. Here’s my key objection to Watchmen 2 in purely money-generating terms: they’ve made the wrong corporate decision. They’ve miscounted the beans. This is the wrong way to go about selling more slabs of whatever. ...DC deciding on prequels seems a little like the publisher trying to get the goose that lays golden eggs to increase her egg-laying...by shaking her vigorously. Maybe more eggs will come out faster, or she'll be so traumatized she lays less eggs, or maybe her neck will break and that will be that. Ten days or so past the official announcement, I'm thinking More Watchmen may be best understood as a blow to comics' dignity. It's product, not art. It's a limited, small series of ideas derived from a bigger, grander one. It's sad. One thing that Watchmen did a quarter century ago was to underline certain values of craft and intent and creative freedom that have helped to yield enough equivalent expressions -- to my mind even grander expressions -- that we may now see this follow-up project for what it is: nothing special. Not Moore. More. I have a half-finished post of my own on this whole sad situation, focusing on explaining why the sky is blue and not refrigerator even if you don't think the problem here is strictly one of creator's rights. When or whether I'll finish it remains to be seen, of course. * Thanks to Plok -- whose name (oddly, from my point of view) is nowhere on his blog -- for leaving his handle in the comments. Incidentally, the ellipses in the quotation are in the original. ** I presume by "American comics industry" he means "mainstream American comics industry" -- in which case I agree. But of course lots of Americans are making comics that are in the Gaiman/Morrison/Moore class besides those gentlemen; they just ain't doin' it, that I've seen,*** for Marvel or D.C.
*** Though I've seen comparatively little outside of the works of those three, in all honesty. **** Yes, actually, this was about the prequels to a work which itself came out twenty years after this was sung. ...The New Yorker: nay, one better: the poetry section of The New Yorker! I mean, they've long since left their origin-story fortress in comics and taken up in their new base in films; they have made many forays into literary fiction; but surely highbrow, snobbish poetry sections of major magazines were safe? No: nothing can stop The SuperheroMan™! He failed to keep his life in balance. As a coin bears with ease its two faces. Into the likeness of what had killed him. Actually a pretty good poem, I think. But what's amazing is how true that's not. This isn't remotely a satire on, or cynical reworking of, or in any other way a distanced version of the genre. There's just nothing like that version of the superhero genre (which is itself, whether it likes it or not (and sometimes it doesn't), part of, indeed at this point a major element of, the genre), one which has been common in mainstream (and other) comics for a quarter century, and which has also been found, albeit less prominently, in film and mainstream fiction and so forth. It's simply a use of the superhero genre to -- well, sort of tell a story, I guess, but mostly to make a poem. My imagined version of Orr's editor might leap in at this point to insist that no, this is a metaphor. It's not a real superhero piece! A point which could only be made by someone more or less completely ignorant of the superhero genre, given that so many of its core examples are meant metaphorically in basically the same way as this poem clearly is. So The New Yorker has not only published a poem which mentions superheroes: it has published a straightforward, honest-to-Superman superhero genre piece. As a poem. Wow. So maybe the Mayan apocalypse is going to happen on schedule after all? Incidentally, some of the readers of this poem -- hell, maybe even Orr's editor, or even Orr himself -- may believe that the superheroes mentioned herein are fictional... well, no, everyone knows they're fiction. What I mean of course is that people may believe they're original creations of Orr: that he picked these names (rather than, say, Superman and Spider-Man) because they're not preexisting characters -- nor, from a legal point of view, trademarks. ** This is, however, false. 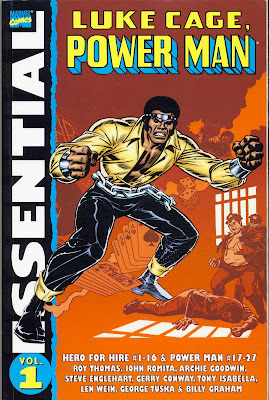 Apparently a movie staring Power Man is in development. 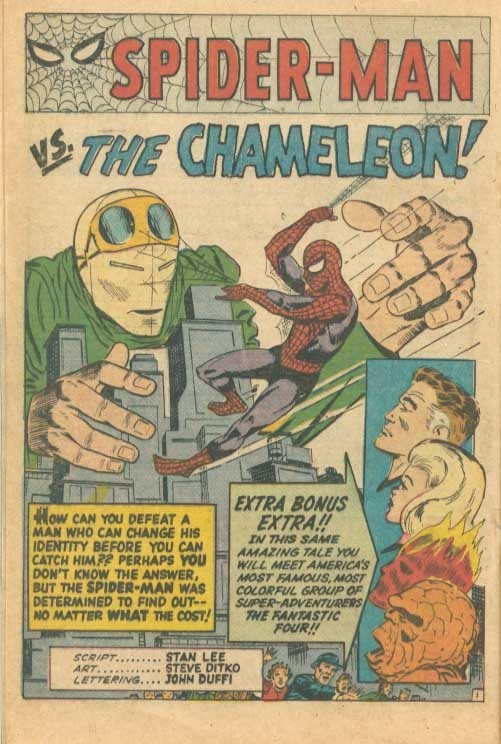 Chameleon doesn't seem to have gotten a movie yet, although he's appeared in several tv versions. 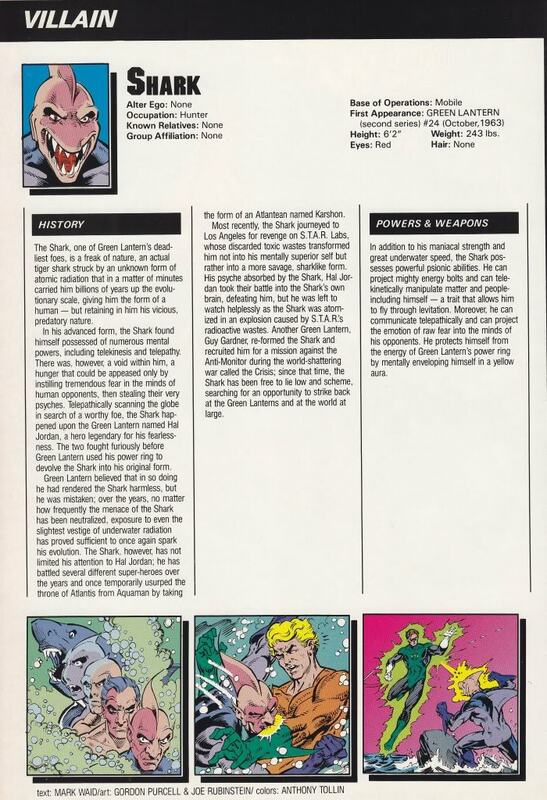 And while he's not called The Human Shark, he does seem to be a human shark (according to the text in the image above, he's "an actual tiger shark struck by an unknown form of radiation that in a matter of minutes carried him billions of years up the evolutionary scale, giving him the form of a human -- but retaining in him his vicious, predatory nature. "), so points for that. This has been the illustrated edition of The New Yorker's poetry section. Update: Reading this post over a day after I wrote it (including, of course, the poem quoted in it) I am drawn to woner whether Orr understands that the notion of a superhero who has "failed to keep his life in balance", one for whom it is not at all true that "they knew/To hold their days and nights in counterpoise,/Their twin selves divided together,/As a coin bears with ease its two faces", is not in the least original with him, but is, in fact, a central recurring trope in the superhero genre. The problem of "bear[ing] with ease... two faces" is the thematic core of a great many superhero stories, and indeed some superheros are designed primarily to fall into that question. I missed this the first time -- and, again, maybe I'm wrong -- but it seems from the poem like Orr doesn't know this. It adds a superciliousness that I didn't hear the first time I read it -- something which, I must admit, makes me like the poem somewhat less (although I still like it, to be sure). * I have no evidence for this. Quite possibly I'm doing someone a disservice. If so, my sincere apologies. ** Unlike, incidentally, the word "superhero" itself, which (I believe) is still trademarked jointly by Marvel and DC -- a ludicrous example of intellectual property overreach, and one that I applaud The New Yorker (presuming their fact checkers turned it up) for ignoring. 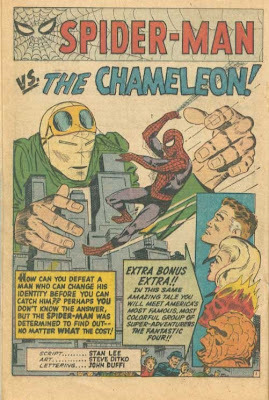 *** I wonder if Marvel & DC think they've trademarked "super-villain" too? I saw this in William James's Pragmatism, chapter 8, where it is quoted and ascribed simply to The Greek Anthology. (An 1895 volume called Selections from the Greek Anthology is online here; this epigram is on p. 275). The Greek Anthology ascribes it to Theodorides, and credits the translator. Other ships sailed the sea with mine, and suffered not. -- from this web site, and a few others, although none that I found credit a translator. I must say that poor Theodorides of Syracuse seems sadly underrepresented on the web. The translator, interestingly, does somewhat better. H. Wellesley seems to be Rev. Henry Wellesley, D.D. (1794 - 1866), principal of New Inn Hall, Oxford, editor & translator of a volume called Anthologia Polyglotta: A Selection of Versions in Various Languages Chiefly From the Greek Anthology (London, 1849), available in full at the link. The link before that is to a genealogy site from which I got his dates; it, in turn, seems to be citing this W. H. Auden-focused genealogy site on which Rev. Wellesley turns up. * From those two sites, both just lists of facts, you get a sketchy but none-the-less real picture of his life: he was ordained at Oxford at age 28, married at 40; and was the father of four children (one of whom died at birth). He became a Doctor of Divinity at age 51, the same year he was made principal of New Inn Hall, Oxford (the latter, at least, because of his uncle, the Duke of Wellington, who was the chancellor of the university). He died at age 71. Fearless set sail from this wreck'd seaman's grave. We perish'd: others safely rode the wave. Shipwreck'd, my comrades 'scaped the raging tide. Take heart, Henry Wellesley! Your work lives on: though you died, it has, so far, weathered the gale. Perished, the surviving ships traversed the sea. * Wellesley is on an Auden-focused genealogical site for the single most distant relationship I have ever had reason to contemplate: Wellesley's sister's great-grandaughter's husband's second wife was the granddaughter of Auden's aunt (by marriage's) brother's son's wife's great-aunt's husband's brother. I swear to God I didn't just make that up (although I might well have gotten something wrong there -- it isn't the easiest chart to put into words! ); in fact, it took some effort to extract that from the site, so I hope you appreciate it. No, I'm not saying that Romney's Terrible, Horrible, No Good, Very Bad Night* last night means he won't win: I'm sticking with the conventional wisdom that he's inevitable, however many newts he has to crush or swamps of repulsive liquid he must drain to get there. But it's sure the case that no one seems to like him. ...the point being that the very idea of it is funny. Say what you will about Obama -- and Lord knows I've said plenty -- but he inspired some genuine enthusiasm (including -- full disclosure -- from me) when he was running (y'know, back when he still believed in civil liberties and all that stuff). But Romney? The Onion -- and truly it calls itself America's finest news source -- has it right: it's a giggle. As Romneymania has grown, the Republican candidate has crossed over from political figure to cultural phenomenon. Countless reverent portraits of Romney have appeared in storefront windows and on building facades throughout the country, often accompanied by one of the candidate's signature inspirational phrases, like "Let Detroit go bankrupt" or "Corporations are people, my friend." Genuinely funny. But not as funny as the idea of actual Romney enthusiasm. * Apologies to Judith Viorst. Yes, having cheated before with two, I'm cheating further today and (on the flimsy excuse of a grand finale) putting up three. I think there are some connections to be made between these poems, but the truth is, I like all three of them: so, as today is the last day of Kay Ryan Week™, I'd just put all of them up. Enjoy. And check out Ryan's other work -- she's just fabulous, as I hope I have amply demonstrated this week. the silly way they stand? had decamped on the wind? So many paired things seem odd. The link goes to an essay by Dana Gioia about Ryan's work, in which this poem was quoted. Be sure to come back tomorrow for our big, multiverse-shattering Kay Ryan Week™ finale! It'll be one for the ages! Yes, I've reached the point where I'm cheating: having begun Kay Ryan Week™ because I couldn't decide on one poem to post, and so thought I'd make up an excuse to post seven, now I'm doing two in a single day. What can I say? She rocks. And I'm running out of days in my week. Having now gotten a hold of The Best of It: New and Selected Poems (from the library), my chief complaint about it is that it's new and selected and not collected: it feels too thin, the contents too brief. I just want to buy her oeuvre and not have to bother with lots of different volumes. Kay Ryan Week™ continues tomorrow! Stay tuned -- same Kay place, same Kay channel! Thus the whale-line folds the whole boat in its complicated coils, twisting and writhing around it in almost every direction. All the oarsmen are involved in its perilous contortions; so that to the timid eye of the landsman, they seem as Indian jugglers, with the deadliest snakes sportively festooning their limbs. Nor can any son of mortal woman, for the first time, seat himself amid those hempen intricacies, and while straining his utmost at the oar, bethink him that at any unknown instant the harpoon may be darted, and all these horrible contortions be put in play like ringed lightnings; he cannot be thus circumstanced without a shudder that makes the very marrow in his bones to quiver in him like a shaken jelly. Yet habit -- strange thing! what cannot habit accomplish? -- Gayer sallies, more merry mirth, better jokes, and brighter repartees, you never heard over your mahogany, than you will hear over the half-inch white cedar of the whale-boat, when thus hung in hangman's nooses; and, like the six burghers of Calais before King Edward, the six men composing the crew pull into the jaws of death, with a halter around every neck, as you may say. Perhaps a very little thought will now enable you to account for those repeated whaling disasters -- some few of which are casually chronicled -- of this man or that man being taken out of the boat by the line, and lost. For, when the line is darting out, to be seated then in the boat, is like being seated in the midst of the manifold whizzings of a steam-engine in full play, when every flying beam, and shaft, and wheel, is grazing you. It is worse; for you cannot sit motionless in the heart of these perils, because the boat is rocking like a cradle, and you are pitched one way and the other, without the slightest warning; and only by a certain self-adjusting buoyancy and simultaneousness of volition and action, can you escape being made a Mazeppa of, and run away with where the all-seeing sun himself could never pierce you out. Again: as the profound calm which only apparently precedes and prophesies of the storm, is perhaps more awful than the storm itself; for, indeed, the calm is but the wrapper and envelope of the storm; and contains it in itself, as the seemingly harmless rifle holds the fatal powder, and the ball, and the explosion; so the graceful repose of the line, as it silently serpentines about the oarsmen before being brought into actual play -- this is a thing which carries more of true terror than any other aspect of this dangerous affair. But why say more? All men live enveloped in whale-lines. All are born with halters round their necks; but it is only when caught in the swift, sudden turn of death, that mortals realize the silent, subtle, ever-present perils of life. And if you be a philosopher, though seated in the whale-boat, you would not at heart feel one whit more of terror, than though seated before your evening fire with a poker, and not a harpoon, by your side. I vividly remember quoting that to my therapist on September 7, 2001 -- and then within a week the world proved Ishmael correct. And then this passage came up in conversation again today. I trust that, that lesson of this passage's truth well and truly learned, the world will not feel a need to repeat it this time. (In truth, I myself had learned it long before.) I am tempted by the superstition that perhaps I should not quote it again: but then, as someone (Raymond Smullyan ?) has said, "superstition is bad luck." As I mentioned a few days ago, I am once again teaching The History of American Thought Since 1865 this semester. And starting last Wednesday, we began covering Pragmatism; I'll continue lecturing on it today (and we'll discuss William James Monday). Imagine sailors, who, far out at sea, transform the shape of their clumsy vessel from a more circular to a more fishlike one. They make use of some drifting timber, besides the timber of the old structure, to modify the skeleton and the hull of their vessel. But they cannot put the ship in dock in order to start from scratch. During their work they stay on the old structure and deal with heavy gales and thundering waves. In transforming their ship they take care that dangerous leakages do not occur. A new ship grows out of the old one, step by step—and while they are still building, the sailors may already be thinking of a new structure, and they will not always agree with one another. The whole business will go on in a way that we cannot even anticipate today. That is our fate. Now, as I said, Neurath himself was no pragmatist -- he was in fact associated with the logical positivists -- but his analogy was adopted by W. V. Quine, who is often described as a pragmatist. (He's not one of the classical pragmatists, but he definitely has pragmatist tendencies in a way that the description is not unreasonable, in my opinion.) In fact, it was Quine, in his most famous book, Word and Object (1960), who popularized Neurath's notion, saying that "Neurath has likened science to a boat which, if we are to rebuild it, we must rebuild plank by plank while staying afloat in it. The philosopher and the scientist are in the same boat." (p. 3) And certainly the idea captures well a concern that the Pragmatists too shared. It's a cute use of the metaphor, although I'll admit that I don't think I agree with the philosophical point it's making. (In fact, I think I rather strenuously disagree with it (at least with what I take it to be.)) I also don't like it quite as much as I do either of the poems from the first two days of Kay Ryan Week -- and I'm frankly unsure if that's because of the philosophical disagreement, or is simply an aesthetic judgment, or some mixture of the two. But I do like it -- and I really, really like that she wrote it. Neurath's boat is a fine craft, and I love to see it get more attention. Stay tuned tomorrow for another exciting day of Attempts' already-hyped-almost-to-metaphorical-bankruptcy Kay Ryan Week™! For day two of Attempts' world-famous Kay Ryan Week™, we have the title poem from Ryan's Pulitzer-Prize winning collection of "new and selected" poems, published in 2010. Come back tomorrow for day three of Kay Ryan Week™ -- a special cross-over edition with the class I'm currently teaching! Come back tomorrow, as Attempts' already-legendary Kay Ryan Week™ continues!